For the Adventist communities in Paradise and Chico, California, November 8 changed everything. For the teachers, parents, and students of Paradise Adventist Academy, that day and the weeks since the Camp Fire have been filled with terror, gratitude, hope, and uncertainty. Part 1: "Get Out Now"
It was a cold, fall morning, the thermometer just brushing below 40 degrees on November 8, 2018. All over Paradise and neighboring Magalia, most people awoke to a normal day. The 170 students and 18 staff at the K-12 Paradise Adventist Academy (PAA) got ready for school. Doctors and nurses finished the night shift and prepared for the day at Adventist Health Feather River, the largest employer in town with a staff of more than 1,200. Come weekend, the Paradise Adventist Church, with an official membership of 1,279, would surely be filled with its hundreds of regular worshipers. There might have been a faint sense of foreboding in the air that Thursday morning, though perhaps not more so than residents of the wooded hamlet in the Sierra Nevada foothills were accustomed to. Wildfire continued to be constant presence in the lives of most Californians; 2017 had been the worst fire season on record, and 2018 had already proved a ready match in ferocity. Earlier in the summer, the Carr fire terrorized Redding two hours to the north, burning over a thousand homes. Even though the heat of the summer months had faded into fall, the timber and brush of Butte County, encompassing Paradise and several neighboring towns, remained bone dry. The National Weather Service issued a Red Flag Warning beginning Wednesday night and extending through Friday, signaling extreme fire danger. Pacific Gas and Electric (PG&E), the main utility provider, announced the drastic — though not unprecedented — step of turning off power to parts of the county to prevent an inadvertent ignition from downed lines. Yet such fire danger and precautions had happened in the past, and although the town had experienced a few brushes with fire in recent memory, including one in 2008 that destroyed a number of homes, life had always returned back to normal. During Wednesday night, winds gusted to over 50 MPH at a nearby weather station, but by Thursday morning had begun to calm somewhat; the sky was clear. Still, the conditions, nursed by months of virtually no rainfall and a relative humidity edging close to single digits, required only a spark. As the sun rose on Thursday, no one imagined that in mere hours, many would be fighting for their lives, the church would be burned to the ground, the school would be nearly razed, and the hospital partially enveloped; soon, the entire town would run for their lives. And a recent academy graduate would be missing. Paradise was known for its trees, which grew all throughout town. When Kandice Cummings moved to Paradise with her family 14 years before, it was because the town offered a little bit of everything: a job for her husband Brock, an orthopedic surgeon; an Adventist school for her three children; and a respite from the Southern California desert. “We moved here for the forest,” she said. Their house, located on the western edge of town, overlooked Butte Creek Canyon that dropped off in a spectacular 1,000-foot-deep gorge. First impressions of the town were inevitably dominated by the pines interspersed throughout — it almost felt like living in a campground, some said — but there were also large deciduous trees, and a majestic oak rose from Kandice’s yard. It was a good place to raise a family. Although the town had a reputation as a retirement community — a boon for all the medical professionals — there were many families and young people as well. The Adventist community was close knit. “The very first Sabbath, I had people clamoring to invite me over for lunch,” Kandice recalled. “As far as a church family, it’s the tightest I’ve ever heard of [or] imagined.” When she went through a battle with cancer, people brought meals to feed her family for months. After retiring from her job, she became a full-time school volunteer, watching as her children went through the elementary school and academy. Despite the general wellbeing and ease of life in Paradise, its location in the forest made wildfires an ever-present danger, and every year the family practiced a fire drill. On the backs of the doors in their house, they kept lists of what each person wished to take in case of an evacuation. On Thursday the 8th, Kandice had a bag packed and ready to go, for she was leaving on a trip with friends later that morning. Her husband left for work in town, and Carson, a high school senior and her last child still living at home, prepared for school. It was just another typical morning in Paradise. On the south end of town, James Mayne got up early, as he usually did, and walked the three-minute walk to his classroom at PAA. This was his sixth year teaching high school history and government, and he still liked to get to work early. It helped that he lived just up the street, also within easy walking distance to the church, the parking lot of which abutted his back yard. Nothing seemed unusual on the cool, clear morning as he walked up the school driveway and past the elementary wing, entering his classroom at around 6:55. At 7:10, James stepped out to walk to the school office. That is when he noticed the plume of smoke, rising above the trees in the direction of the church to the northeast. This by itself wasn’t so strange, as smoke had been an accepted part of life ever since moving to the area. “Every summer I’ve been here, we’ve had fires somewhere in California that have affected air quality in Paradise,” he said. James and his wife had received the notices that week from PG&E that power might be preemptively cut, but they had not been terribly worried. Unlike Kandice Cummings, unlike the Feather River hospital, they were not located at the edge of town where the forest took over from streets and buildings in earnest. School, church, and house were all right in the midst of things. “The entire town would have to burn for our house to be threated,” James remembered thinking. Just five, perhaps 10 minutes later, he went outside again. The smoke had grown significantly, still a distinct plume but now taking up a good portion of the horizon. It was unusually close, he thought, and had grown with extraordinary speed. He called his wife, who was still at home, and told her to start packing just in case. Perhaps this wasn’t a routine fire after all. Kandice saw the plume but didn’t think too much of it. A repairman had come by the house at 7:30, and they stood outside taking pictures of the rising smoke. “But it was in Concow, it wasn’t a threat to us,” Kandice remembered thinking. They were on the opposite side of town from the smoke and whatever fire was hiding somewhere in the forest. They went back inside. James noticed that the smoke started to obscure the sun, which was still hanging low in the sky. The light, which had been bright with morning clarity just a few minutes before, began to turn red and orange — like a second sunrise. He didn’t have class until 8:15, so he ran back to his house and helped his wife finish packing up a few possessions and important documents. There hadn’t been any evacuation order, but she was about to leave for her work down in Chico anyway, and might as well take a few essentials just in case. Along with their two dogs, she pulled out of their driveway. Around 7:45, James got back to the school, and was just heading to his classroom when he saw Principal Monte Nystrom. “He said, ‘We are evacuating the school,’” James remembered. No one at the school had received any indication from authorities about a need to evacuate, but Nystrom looked at the apparent location of the fire and the direction of the wind, and made the decision to get everyone out. It was a decision that possibly saved lives. Although main classes for the day had not yet begun, many students had already arrived for band and other pre-class activities. James grabbed a radio, and along with the other teachers began going from room to room, finding all the students and taking them to the main office, also making sure their parents were on the way. Even in the face of an evacuation, the mood was light. “People were kind of joking around,” James remembered. “No one thought that this was a major incident.” As parents came to get their kids, he overheard some expressing incredulity that the school had already decided to evacuate. There had been no official evacuation order for the town, after all. It was only a few minutes until Kandice’s phone rang. A friend who lived on the other side of town had just received the first evacuation order, and asked if Carson could come help move some of their cars. At 8:03 a.m., the Butte County Sheriff’s office issued that first evacuation notice for within city limits, but unbeknownst to many, the fire had already reached the eastern edge of Paradise. After the 2008 fire, emergency planners put in place a system of evacuation zones, with the hope that evacuation in stages would prevent dangerous congestion. Carson left, and soon after Kandice’s friend called again. “There’s a house on fire next door. Call 911, because I can’t get through,” the friend said. Kandice called 911, but instead of just taking Kandice’s report, the operator issued her a chilling directive. “Get out now, get out now,” the operator said. Grabbing only her suitcase, two pets, and some wedding albums, Kandice left. She called her elderly mother, who lived on her own nearby but owned a car, and told her to start driving as well. “I really feel like the holy spirit spoke to me, because there was just this overwhelming thought of just go, just get in the car and go,” Kandice said. At the academy, parents picked up the last of the students. James, along with two other staff, waited out front with the final student until around nine o'clock. They didn’t know exactly what was happening at the northeast edge of town, but they watched as ash and large chunks of scorched tree bark began to rain down. The smoke and ash began to block out the sun completely, turning the sky into a roiling mix of red, orange, and black. The school lights, equipped with night sensors, blinked on. “It definitely felt apocalyptic at that point,” James said, “but still, we just figured [the fire] might be in the canyon.” With all the students finally gone, the staff parted ways. Now alone at the school, James took a final walk through his classroom, noting how the light, eerie and tinted, shimmered through the room. Leaving the campus, he got an indicator of how different the course of today would be compared to past fire threats. Academy Drive, the small and usually quiet side road running between the school and the church, was filled with cars. It took several minutes just to cross to his house on the other side. People are trying to get out of here fast, I should probably hurry this up, he thought to himself. Grabbing just a handful of things, James got in his car and started driving. Paradise was not swept by a single wall of flames that day. Fire personnel would later refer to the “ember cast” characteristic of a wildfire, burning chunks of debris picked up by the winds — intensified by the fire’s own heat — and thrown ahead of the main path. As satellite imagery of the town that morning would show, areas started burning on the western border before flames had traversed the entirety of Paradise’s interior. This meant that for Kandice and the hundreds of others fleeing town on Skyway, fire would soon surround on both sides of the road. Clark Road ran through the middle and out of town, and James first tried to merge onto it going south, but found traffic stalled. “It was just completely clogged with cars,” he remembered. “The sky was pretty dark, almost like it was ten o’clock at night.” A friend then called and asked James to check on his wife who was still at home, so he left Clark and wove through side streets to the house, only to find she had left just moments before. The detour had taken him closer to Skyway, and so he decided to see if it was more passable. At the edge of town, Skyway turned into a divided road, with two lanes northbound and two southbound. In a fortuitous moment, James reached it just after police opened the northbound lanes for traffic going the opposite direction. He merged with the faster moving traffic in the new lanes, and soon put the black void that was Paradise behind him. “My thigh got hot through the car door,” Kandice remembered, as her car crept down Skyway and flames drew closer. “But I was able to move.” She also reached the point where the road divided, and like James diverted into the northbound lanes. “I went through a big smoke cloud, and then all of a sudden, it was light again,” she said. Kandice Cummings had made it out, but her relief was short lived, for her mother, husband, and son were still somewhere behind — and conditions were only getting worse by the minute. Carson Cummings also tried to drive south and out of town, but the traffic turned to gridlock and fire began to surround his car. He reached Kandice on the phone, and described with rising panic the coming flames. He called his father, still unsure what to do. “Get out and run,” Brock told him, and so Carson did, abandoning the vehicle and taking off on foot. For a mile he ran. At one point, cell phone still in hand, he recorded a few seconds of video. The camera is focused on his face, and the microphone catches the sound of his breathing, labored from the smoke, and the cadence of his footfalls; all around is pitch black — until for a split second the camera shifts and reveals the shine of a few headlights, then the orange glow of flames silhouetting trees and buildings behind him. Brock, who had also started to evacuate, was able to rendezvous with Carson further south in town, and then father and son drove together, looking for an escape route. Fire blocked the path down Skyway, and they diverted onto Neal Road, a smaller avenue that continued down toward Chico. Again, gridlock stopped the traffic as flames continued to advance. This time, Carson did not have to get out alone, as he now ran alongside Brock, who still wore his suit and tie from work. Together, they outran the flames. After a mile and a half, traffic began to move again. Strangers picked them up, and they rode the rest of the way to Chico. Kandice was reunited with her mother first, who must have been not too far behind on Skyway. Over and over, she tried calling her son and husband, but by that point the fire had incapacitated the cell towers and she was unable to get through, frantic in the knowledge that the last time she had talked to Carson, he was trapped in his car. Along with many other Paradise residents, she waited in a parking lot at the edge of Chico, watching and waiting. It speaks to the magnitude of events on November 8 that by the end of the day the Cummings family would consider themselves among the lucky ones. Unlike some Paradise residents, they were all reunited, alive and unharmed. In time, they would learn that both their house and Kandice’s mother’s house had been completely destroyed. As the rest of November 8 unfolded and people made their escape, attention began to shift from personal survival to accounting for the whereabouts of family and friends, and the difficult questions of whether everyone made it out alive. To the PAA community, it soon became clear that someone was unaccounted for. Part 2: Where is Cesar? Either by word of mouth or by direct contact, James started to cross students off as accounted for. Some would have harrowing stories. Jaron Brown, a junior who had just gotten his driver's license, returned home after the school evacuated but soon had to flee, driving his family’s travel trailer through Paradise, his sister and grandmother with him, barely making it through the flames, a story his father recounted to Time magazine. While most of the stories were of escapes, James heard that no one had been able to locate Cesar Rodriguez-Muñoz, a graduate of PAA the previous spring who remained close to many in the school community. It was true that Cesar never made it out that day. He had just woken up at around eight in the morning when he got a call that said there was a fire in Paradise. Cesar lived with his mother in Magalia, the even smaller town just to the north of Paradise, and she had already left for work at the hospital. “I started getting calls from a few people telling me it was bad, but I didn’t really pay a lot of attention to it,” he said. The wind was pushing the worst of the smoke to the south and east of Magalia, and for a time he stayed put, waiting for an evacuation order. Then a relative called and said things were getting very bad — and that he should get out. Leaving his house, Cesar got onto Skyway and drove south toward Paradise, puzzling at the long line of cars going the opposite direction. Although Skyway continued to the north and eventually met highway 32 in a circuitous route out of the mountains, taking Skyway south and through Paradise was the much shorter way to Chico. There was a large cloud of smoke ahead, but little indication that he was driving straight toward a hellscape where thousands were fighting for their lives. Only five minutes down the road, Cesar was stopped, the road blocked off. “Finally it hit me the town is not open,” he said. Still trying to figure out what was happening, he called a friend and was in mid conversation when the line went dead as the fire took out the tower. With traffic in gridlock on the northern escape route, Cesar did the only other thing he could think of: he went home. A trip that took five minutes one way took two hours the other, as he fought back up Skyway and then back to his house. There Cesar found that one neighbor had also decided to stay. All lines of communication were down, but the neighbor had a police scanner, and told Cesar she would let him know if the fire got closer. “I really wanted to get a message out and just tell everyone I’m alright,” he remembered. Many businesses on Skyway, like this antique shop, were burned almost beyond recognition. Driving both north and south on Skyway became a harrowing and even deadly journey for many. Word spread throughout the school community that Cesar was missing. His mother had made it safely to Chico, but the last anyone had heard from Cesar he was still in Magalia. Throughout the rest of Thursday, the fire continued to burn through Paradise and Magalia, but little was known about what exactly was taking place up the mountain. “He was the one that people knew wasn’t accounted for that first night, which was pretty scary,” James Mayne remembered. Many of the older high school students were friends with Cesar. “My son and all his friends were praying for [Cesar] all night long,” Kandice Cummings recalled. A police officer knocked on Cesar’s door the next morning. He had survived the night, and the true extent of his peril only made itself clear as he was escorted back through Magalia and Paradise. Much of Magalia had burned. Some people fleeing north on Skyway had been caught by the flames, and Cesar realized that going back to his house may have saved his life. They had to weave through the streets of Paradise, making detours around where downed power lines and other debris blocked the roads. They stopped to collect more survivors, some who were hiding out in stores and other buildings. Ash filled the air, and the light had an orange tint as fires still burned in places, buildings smoldering. At one point, they had to drive between tall walls of flame on each side of the road, and Cesar could feel the heat radiating through the car. Down in Chico, he was reunited with his mother, who was overjoyed at the sight of her son. The irony that his experience on Thursday was perhaps less harrowing than many, while he was perhaps the cause of the greatest concern in the PAA community, was not lost on Cesar. “I was this center of attention, and I was perfectly fine,” he said. On Friday night, the day after the fire, some of the academy community got together at a house in Chico. James saw some of his students in person, and over the weekend along with the athletic director Jason Eyer, tried to keep calling those they hadn’t seen. Their purpose was twofold: to check on the wellbeing of all the families, but also to let people know that the school staff were already committed to resuming classes. The damage to the town was still being revealed, but classes were going to go on, one way or another. Rumors and inaccuracies swirled for a time about what was left in Paradise, but over the weekend the extent of damage came into focus. The church was gone, both the sanctuary and wings completely leveled, as was the Dorcas center that stood nearby. The K-4 wing of the school, just across the street from the church parking lot, was also a smoldering ruin. But the rest of the school — middle school rooms, gym, high school, and offices — was still standing. The large grass sports field in front of the rest of the school had likely served as enough of a buffer to keep some of the flames at bay, though the shop underneath the gym did suffer fire damage. Almost all the school staff lost their homes, including James Mayne. And like the Cummings family, the majority of students living in Paradise lost their homes as well. It appears that part of the message on this scorched monument beside Paradise Adventist Academy once said "Stronger Together." It had been over a week since the start of the fire when I visited Paradise. The town had been turned into a fortress on a hill; military and police guarded the roads, restricting access to both combat looting and safeguard the ongoing search for human remains. The first burned-out cars came into view before even reaching the edge of town, abandoned where the fire had overtaken. Though the flames had long since moved on, smoke still rose in places from holes in the ground, and the smell of burning pervaded everywhere. The school grounds should have been busy that day, filled with voices and the hum of teachers and students going about their day. There was noise, but instead it was from the chainsaws and trucks of PG&E workers as they cut large sections of burned trees out on the road. Then they drove off to another part of town with no warning, and there was only stillness. Front of Paradise Adventist Academy after the fire. The school sits empty and quiet. It was evident fire burned to the very edge of the school, consuming shrubs and plants right next to the walls. At some point it appeared water was applied, as dirt and char from the flower beds was splattered against the walls. Where the K-4 wing had once been, only rubble remained. The husks of children’s miniature chairs stuck out of unrecognizable debris. Along the street, tall pine trees still stood, giving evidence to the speed of the fire in how the lower reaches were burned and the tops remained mostly intact: the fire was almost horizontal when it blew through, moving so fast that it often did not burn the entire tree. Pine needles were left all pointing in the same direction, as arranged by the fire’s winds. Metal chairs are some of the only recognizable items where the K-4 wing once stood. Across the street, green grass and blooming flowers gave a false sense of beauty when entering the driveway to Paradise Adventist Church. Only after walking closer to where it should have been did the complete destruction present itself. The charred ends of large wooden beams marked where the sanctuary had once stood. Only some concrete and stonework remained. Behind the church, it looked like someone had just parked their car in front of the Dorcas Center, and I wondered if someone else was there. Only when walking to the front could I see the melted bumper and the sagging headlights. Parked just feet from the incinerated building, the car remained nearly intact. Only metal and stonework remains of the church. Two fire extinguishers sit upright in the remains of the church wing. Melted recycling cans near the Dorcas Center show the direction of the fire's heat. And so it was, driving through the rest of Paradise, that it wasn’t the acres of destruction that appeared the strangest, but rather the random moments of preservation. Whole neighborhoods were gone, and then there would be a solitary house, or a string of houses, looking like nothing had happened at all. This is typical when wildfire overtakes a developed area, experts say, but it appears so unnatural and unexpected, like bombs dropped all over the town except for small pockets that didn’t detonate. After looking at so many burned-out buildings and cars — and keeping a wary distance from the evidence searchers in their white protective suits who still combed through debris looking for human remains — it was a relief to turn back toward the valley and leave Paradise to its smoldering, ruined self. Less than two weeks after the fire, Skyway had long been cleared of debris. On Monday, November 26, classes resumed for Paradise Adventist Academy — not in Paradise, but in Chico. Even though the majority of teachers lost their homes, all were there for the first day back. Some are living with friends in Chico; some are staying in RVs. Despite a large percentage of students also losing their homes, 91% of the student body was present. Elementary grades are sharing space with the Chico Oaks K-8, while the high school teachers are using rooms in the Chico Seventh-day Adventist Church. After the fire, a group of teachers and students were allowed into Paradise, where they loaded up books as well as tables and chairs to use in the makeshift classrooms. Still, the teachers have had to scramble, figuring out how to create a classroom in a strange space and without all of their normal supplies. On that first day, a counseling team from Loma Linda Adventist Academy came to provide support for students. Since then, teachers attempted to move back to a more typical curriculum. Another important part of resuming life has been sports for the older students. “Sports are a wonderful outlet for our kids,” Kandice Cummings said. The volleyball team was met with an unexpected act of generosity when rival Forest Lake Christian School raised money to provide the team with new jerseys and equipment, as reported by CNN. On November 30, the basketball team hosted a previously scheduled tournament, only with the help of PUC Prep, the K-12 school of Pacific Union College. Paradise team members traveled several hours to Angwin, California, to play the games they would have played in their own school. The members of the Paradise Adventist Academy community are thankful to be alive and determined to continue on with normal life as best they can, yet many uncertainties remain. The long term outlook of the Seventh-day Adventist community in Paradise — and the whole town itself — will undoubtedly be tied to the future of Adventist Health Feather River Medical Center. While previous reports questioned whether the hospital would ever reopen, a press release from Adventist Health the week of December 2 reiterated a commitment to reopening the facility. 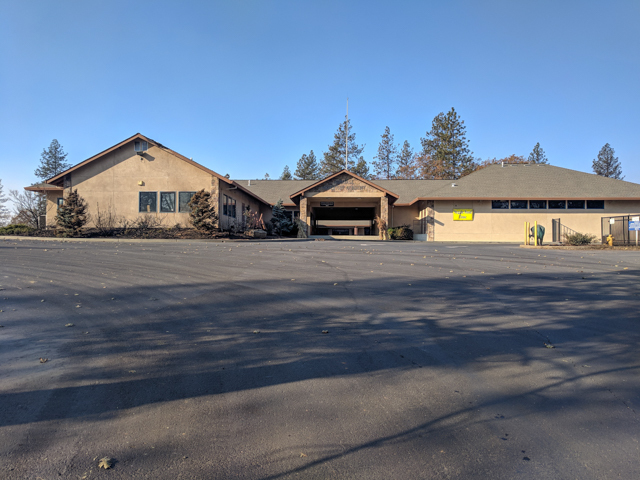 Clinics in Chico and Corning already reopened in mid-November, and the Feather River Health Center clinic in Paradise will be "ready to reopen in the coming weeks, as soon as public access is restored," the written statement said. The Feather River Health Center, located on Skyway, appeared to be undamaged from the fire. Adventist Health cautioned that it would take more time to reopen the main hospital on Pentz Road. "Although some of our newer buildings were spared from the worst of the damage, the infrastructure, access, clean up and population needed to support an acute care campus are going to take longer to be restored," the statement said. All of the cleanup and rebuilding efforts will take time, which places employees not employed at the smaller clinics in a difficult position. "We are focusing our attention to support the immediate and long-term recovery of our associates and their families. We have informed them that it will be at least a year or more before many services are restored, and longer before they reach their former scale," Adventist Health said. Some hospital employees will also be given opportunities to work elsewhere in the Adventist Health system. Even with the efforts to take care of employees — Adventist Health says it has already raised $6.5 million in assistance — it will be some time before the hospital operates as it once did, if a return to its original size is even possible. From Pentz Road, Adventist Health Feather River Medical Center looks deceptively unharmed. However, buildings in the rear, including many patient rooms, were destroyed and there are reports of water damage in other parts of the hospital. During the week of December 2, evacuation orders were lifted for some areas of Paradise. Residents were finally allowed back in to assess their properties, but for many there is nothing left. As of December 4, the official death toll stood at 85, with nearly all who had been reported missing accounted for. There is little precedent for what to do when nearly an entire town is destroyed, and also what to do when a school is miraculously spared. The rest of the school year will take place in Chico, but what happens beyond is still unknown. The only certainty is that the closeness of the school community that has allowed life to continue will still be paramount. PAA staff expect the real test of student retention to begin after Christmas break, as more families determine their long term work and housing situations. But for now, teachers, students, and parents will do their best to make it through each day, as Paradise Adventist Academy remains a school without a town. Alex Aamodt is a writer based in Portland, Oregon. He studied English and Spanish at Walla Walla University, and also works as a rock climbing and mountaineering guide in California. Photography for this story by the author.